You invested in How To Make Smart Content Decisions and you’ve come here for a behind the scenes look at the funnel, which brought you here. Fact is, it all links back to the Pioneer Sales Journey. Remember that nifty little six-step content driven sales process that can convert a faceless member of your audience into a happy customer? Well, that process has guides the steps I’ve laid out for you. And it all started with a little digging and thinking to figure out how I could get on the radar of people – just like you. You see, if you’ve invested in the workbook, there’s a good chance you’re my perfect WHO. And if you’re a business owner with a message to share – and wish to do so in a non-hypey, ‘non-salesy’, authentic sort of way, then we’re going to be a good match. You see, I like to help people with a genuine desire to serve to communicate their message. And I do that through awesome content! If you’re looking to sell in a ‘non-salesy’ way, then informative content is the answer. Interestingly, I chose to blend the CAPTURE and CORE stages together on this occasion. As the article was handed out at a big event, it made sense to make the workbook easy for people to buy (rather than just asking for contact details). I cut the price from £35 to a tenner and whilst I was making less profit per sale, by offering my content at this accessible price, I increased the number of people who got to read and engage with my content. Now there is an argument for offering the workbook for free, but you do need to be careful with how much information you give away. Free content is great, but it’s not valued as much as something that people invest in. And that’s why I had the £10 price tag (or £13.50 if you bought post-event). This amount is low enough to make the purchase risk free, but sufficient enough for people to have a vested interest in reading what I had to say. 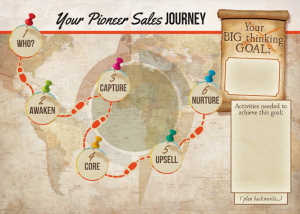 Looking again at the Pioneer Sales Journey, you can see that the next step is the upsell. So what have I got for you? Before we come onto that, let me first explain how you can go about deciding what to offer as the ‘next step’. The answer is to start with the end in mind. In short, you need to understand where you want to take your perfect WHO to, ultimately. This will usually be your premium, high-ticket offer. Or to put it another way, the product or service that allows you to add most value to your perfect WHO? In my case, this is ongoing ‘partnership copywriting’. This is where I write for a small number of clients who have an important message, but don’t have the time, inclination or skill to do the writing themselves. I call this partnership copywriting because this isn’t just about writing words, this is about getting inside someone’s head and then getting ‘in sync’ with them so that I can write as if I were them. 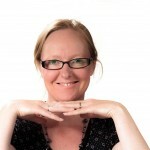 It’s about making it easy for a business owner to get personality rich content – without the wrist ache or stress that comes from writer’s block. We’re guided by the Pioneer Compass as we do this work. 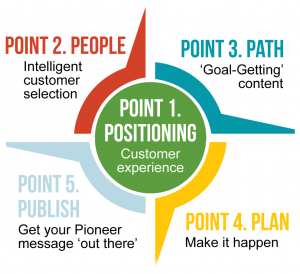 The compass is my five step signature programme for creating content that connects and converts. So given this partnership service is my ultimate service, what’s a baby step to take business owners who have read my Smart Content Guide closer to this goal? Simple, offer a discounted one-hour consultation call. It increases the chances that people (like you) will get more value from their investment in the Smart Content Decisions workbook. That’s because you can tap into my experience and knowledge, bounce around some ideas, and get clarity on how to take your next steps. So it adds value to you. Secondly, in terms of the wider funnel, if we make a connect when we talk on the phone or via Skype, it means you’ll be more likely to take the next step again. For example, you may enquire about my partnership copywriting services or book a Pioneer Away Day. Can you see how this works? How could you use this model too? So this is a genuine upsell opportunity. My ‘Get Clarity’ one-to-one consultations usually cost £195, but using the special voucher below you can book one for just £75. During a strategic one-to-one, I’ll ask the tough questions and together we’ll bounce ideas, explore options, and come up a robust plan for your next steps. Imagine… what progress could you make after a fully focused, one-hour Skype or phone chat dedicated to whatever questions and issues have bubbled up after reading the Smart Content Guide? Remember, it’s my goal to ensure you finish our call motivated, informed, and ready to take action. I want our time together to help you move forward, make tangible progress, and get your awesomeness “out there”. If you’d like to take this next step with me, simply complete the quick form below. I’ll be in touch to book your one-to-one and arrange payment. Once we’ve agreed a date, I’ll send you my one-to-one questionnaire. To get the most from our time together you’ll need to complete this and whizz it back to me. Your answers will help me fully prepare for our conversation so you can make the most of every last minute. That’s right. No idle chit-chat and awkward small talk. We’ll get right down to business so you can squeeze every last ounce of value from our call. I hope you’ve found this walk through useful, and if you’d like to take the next step and book a call with me, I’d be very happy to help you.